Government offices remained closed on Friday except to conduct search operations and support the Sewol victims and their families. Private companies have also temporary held off or scaled down both internal and external events as the country mourns the latest tragedy, which has brought Korea to a standstill. As the death toll ― mostly teenagers ― from the devastating accident continues to increase, the public outcry and criticism of the government’s lack of regulatory oversight and poor crisis management is also on the rise. The public’s hostility and blame has not only spread to government agencies such as the Ministry of Security and Public Administration and the Ministry of Oceans and Fisheries, but also to the alleged culprits of the accident ― the owner of ferry company Chonghaejin Marine Co., the Yoo family. The two ministries are key government agencies with the former in charge of national security and the latter of marine regulatory policy. The Security Ministry, as critics noted, seemed unprepared for the crisis. On the other hand, the functions and operations of the Oceans Ministry, its affiliated enterprises and regulatory units have been compared to the mafia. 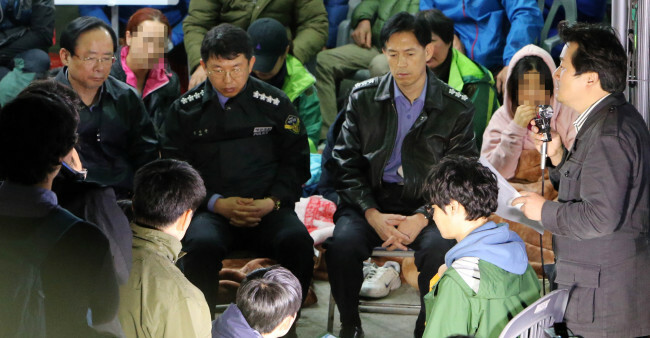 Investigations into the matter have now expanded to the Yoo family and their Christian cult, Salvation Sect, seeking to find if their religious activities had anything to do with the deaths of hundreds of ferry passengers. The cult’s business connection to the Sewol accident is reminiscent of a 1987 unsolved mass suicide case that also involved the sect, loan sharks and Yoo Byung-eon, who was the group’s pastor at the time, as one of the prime suspects. In light of these latest revelations, questions are cautiously being raised as to how the country can recover and get back to normal economically when public and private organizations seem to want to keep a low profile to avoid public criticism. “The mood is not so good at the moment, and we’re very careful of being a target of blame,” a spokesman for a local bank said. Public agencies and their officials are also keeping their heads down in the aftermath of one of the country’s worst maritime disasters. Finance Minister Hyun Oh-seok canceled a meeting with economy-related ministries slated for Wednesday to instead discuss support plans for the ferry disaster survivors and victims’ families. Bank of Korea Gov. Lee Ju-yeol also canceled Wednesday’s economic review meeting at which he was to exchange a range of views concerning recent economic developments with heads of financial institutions and scholars. The Finance Ministry and the BOK said the cancellations reflected the social atmosphere of collective mourning since the disaster. Many companies, from automakers to banks, have also canceled social business events slated for this week. Local festivals, school trips and ferry tours have been canceled or delayed, bringing the tourism industry to a grinding halt. Tour companies in Seoul have seen more than half of their group tour reservations canceled as of April 18, according to the Korea Tourism Association. Reports said more than 7,000 airline tickets were canceled after the Education Ministry banned school trips for the first half of the year. Major retailers’ sales continue to decline in the aftermath of the Sewol accident as consumers’ shopping has dropped off and retailers have avoided marketing activities. CJ O Shopping said Wednesday its sales fell 20 percent Saturday and Sunday from a week ago and another 5 percent Monday. Sales of E-mart and other big-box stores are also dropping slightly after the ferry accident. A major hotel in central Seoul said at least seven business conferences were canceled this week and it received a large number of room cancellations. Critics remained cautious in predicting the accident’s impact on the country. Others worried about the impact these developments are having on the domestic economy. “Many companies are putting their business on hold. It is not a good sign. The slowdown in business operations may result in a temporary economic slowdown,” a market analyst said. Domestic consumption has also been hit, with credit card usage falling as much as 8 percent in the five days following the sinking of the Sewol.